DAVAO CITY, Philippines - Former Davao City mayor Benjamin de Guzman and a prominent lawyer and son of one of the country’s most respected leader Karlo Nograles have loomed as the top choices of the ruling Lakas-Kampi-Christian Muslim Democrats for the mayoralty draft in the 2010 elections. The scenario developed as local party stalwarts fell short of getting a commitment from Speaker Prospero Nograles to consider the mayoralty nomination during the Davao City forays of the House chief Thursday until yesterday. Party leaders have been asking Nograles to accept the Lakas-Kampi-CMD mayoralty draft amid mounting clamors from around the three districts of the city. 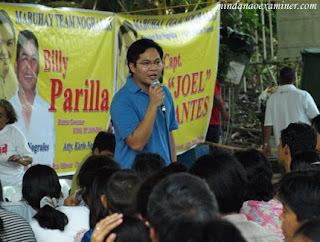 Nograles has taken the position of staying in the national level than delve into local politics. In his Saturday radio program “Kalamboan Dala Tanan,” the young Nograles said the final selection process for mayor and other local positions in the city will begin as soon as the massive recruitment of Lakas members is completed. “Applications for Lakas-CMD membership in Davao City have accelerated since the Commission on Elections ruled in favor of its merger with (President Gloria Arroyo’s) Kampi party after a challenge about its legality,” the young Nograles, who is also the Speaker’s chief of staff, said. The lawyer said his father sits as vice chairman to Lakas-Kampi chairperson President Arroyo while he acts as interim leader of the party in Davao City. “After we have sworn-in all the new Lakas-Kampi-CMD members in the city, we will immediately proceed to the final selection process,” explained Karlo in his radio program aired at dxAB, which had De Guzman and youth leader Jo Anne Bonguyan as guest panelists. De Guzman has confirmed that he is into talks to join Lakas-Kampi-CMD. A leader of Laban ng Demokratikong Pilipino in Davao, De Guzman made a surprise appearance at the groundbreaking of the Nograles-initiated sports dome project at the University of Southeastern Philippines last Thursday in which he made the revelation on his political future. On the other hand, Bonguyan, a niece of former Davao City vice mayor Luis Bonguyan, joined Team Nograles last month. The young Nograles said the Lakas-Kampi-CMD membership in Davao City will be given the opportunity to voice out their choices on who could be their candidate for mayor next year. “If the members choose Mayor De Guzman to run for the top local position, then he must accept it or leave the party,” he said.